Constantine Baecher is born in Boston. He began his training at the Walnut Hill School and he attended the theater class of the Hamburg Ballet School. In 2003, he joined the Corps de Ballet at the Royal Danish Ballet. With the Royal Danish Ballet, Constantine Baecher has danced ballets by Alonso, Balanchine, Bournonville, Flindt, Hübbe, Kylian, Lander, Macmillan, Maillot, Martins, Preljocaj and Scholz. As well as creations by Greve, Matchevsky, Midjord, Neumeier, Ratmansky, Rushton and Uotinen. He danced soloist roles in Uotinen’s Le Sacre du Printemps (principle male), Arveprins Frederik in Flindt’s Caroline Mathilde, Brother Lorenzo in Neumeier’s Romeo and Juliet, soloist male in Rushton’s Requiem, pas de deux in Kylians ‘Petite Mort,’ and Bella Figura, and the Hungarian Lead in Martin’s Swan Lake’. Constantine also co-founded Cross Connection Ballet, which first performed in June 2008. He has choreographed four pieces for New Chamber Ballet in New York: Wanderlust in 2003, Terzetto in 2006, Viduity in 2007, and Arachnophilia in 2008. In Copenhagen, he has choreographed A Quite Night of Murder, for the Royal Theater’s Choreography Workshop in 2006, and The Ungentle Guest for the Royal Danish Ballet in May 2008. 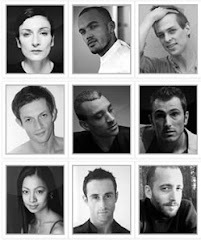 Constantine choreographed Aria and Anvil’ as well as Deportee, for Cross Connection Ballet in June 2008, Chopin Dances in April 2009 and Stravinsky’s A Soldier’s Tale, for Christians Kirke’s summer music season.